Buy-sell agreements take many forms and perform many functions. Structuring Buy-Sell Agreements: Analysis with Forms, Second Edition examines how buy-sell agreements work and analyzes all the tax, legal, and business issues associated with these agreements. 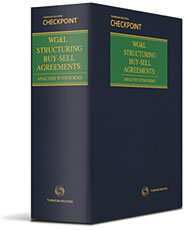 It also provides planning strategies as well as advice on avoiding the pitfalls that can arise in crafting these agreements and offers numerous sample agreements and checklists to assist practitioners in crafting these agreements for their clients. Extensive coverage of the estate planning implications and uses for these agreements is also provided. Transfer restrictions, funding mechanisms, valuation methods, and other special considerations.